Learn who cares. (And why.) Then relentlessly create value for them. What is the Value Proposition Wheel? 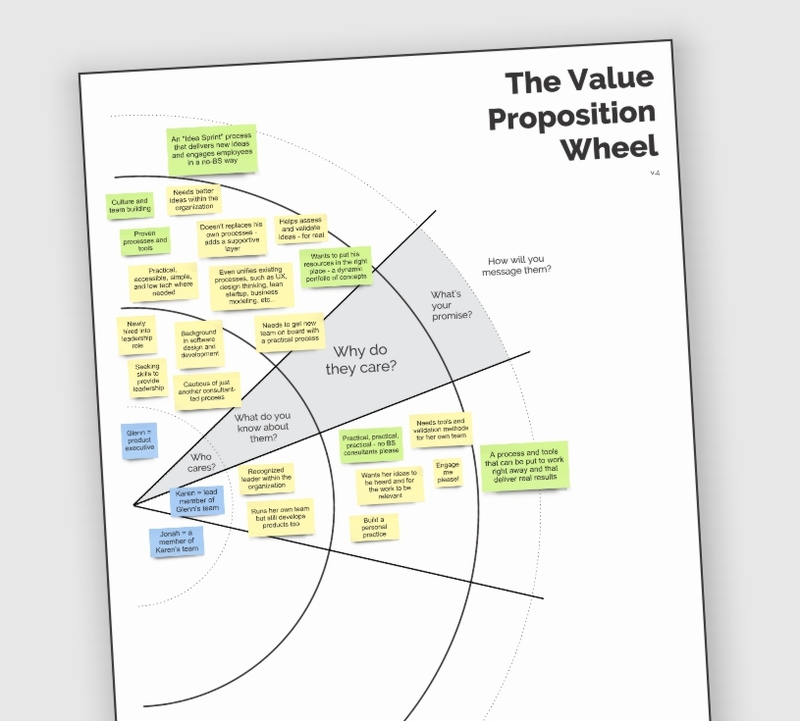 The Value Proposition Wheel is one of the most useful tools in our toolkit. We cooked up the first version in the 15 minutes before a key all-stakeholders meeting while we were right in the middle of launching our own social business, and it has evolved since then into what we’re sharing here. We use it all the time in our own ventures – startup and corporate, high tech and low tech, new and old – as an incredibly important part of our innovation design arsenal. It’ll help identify and uncover the key pre-personas for the offering you’re putting together. It’ll help you identify and more deeply understand why those key human beings (i.e. not markets!) will care about and adopt what you’re offering. And it’ll help you refine the key value promises and propositions – all as part of a process of designing the most highly impactful and imminently feasible version of your idea possible. We also use it to help put together the early stages of a communications plan. And it’s deliberately complementary to the Idea Napkin, the Idea Model, and other tools such as the lean and business model canvases. Most value proposition tools start with an assumption about who is the customer. The Value Proposition Wheel goes beyond that in a deliberate and iterative way, and using what we call “testable pre-personas”. This makes sure your value proposition analysis – and with it your whole venture – is focused on the right customers from start to finish. 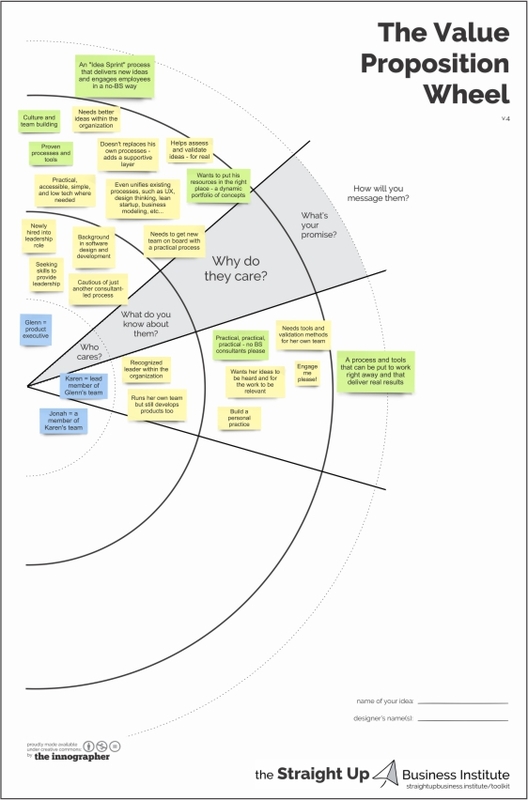 The tool provides a simple visual framework that allows you to engage and deepen your understanding of your customers and beneficiaries, in turn helping you design the products, services, and experiences they really need. Go from vitamin to painkiller for all of the key stakeholders in your value network, and watch things transform as a result. Value innovation is the process of deliberately and insightfully changing your opportunity in order to create the most value possible. This tool helps innovators do just that by demanding a shift in perspective from the common “okay, what are we building here?” to the leader’s “wait, what smart combination will allow us to maximize the value we create?